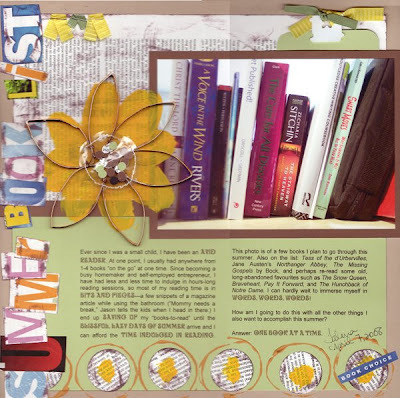 I am teaching two classes this upcoming weekend at our local scrapbooking retreat. One is about Journaling, and one is called "Recycled Embellishments". I have just finished the class project demo layout for the Embellishment class, and am now displaying it for your viewing pleasure. The pull-out tag behind the photo will eventually list all of the books that I read in 2008. So far, there is only one on there. Pretty sad, I know. I was absolutely thrilled at my good fortune today when I rescued a beautiful old-edition encyclopedia from it's imminent fate of being thrown into a dumpster, which now has had at least one page immortalized on this scrapbook layout. This weekend, several more of its pages will be wending their way around town into people's photo albums. I estimate that the total cost of this layout was $1.50. Compare this to an average layout utilizing all pre-purchased embellishments and accents, which can run anywhere from $4 to $10 a page. Yet another instance where being "green" actually saves you money--it even applies to scrapbooking! "Ever since I was a small child, I have been an avid reader. At one point, I usually had anywhere from 1-4 books 'on the go' at one time. Since becoming a busy homemaker and self-employed entrepreneur, I have had less and less time to indulge in hours-long reading sessions, so most of my reading time is in bits and pieces—a few snippets of a magazine article while using the bathroom (“Mommy needs a break,” Jason tells the kids when I head in there.) I end up saving up my “books-to-read” until the blissful, lazy days of summer arrive and I can afford the time indulged in reading. This photo is of a few books I plan to go through this summer. Also on the list: Tess of the d’Urbervilles, Jane Austen’s Northanger Abbey, The Missing Gospels by Bock, and perhaps re-read some old, long-abandoned favourites such as The Snow Queen, Braveheart, Pay It Forward, and The Hunchback of Notre Dame. I can hardly wait to immerse myself in words, words, words! "How am I going to do this with all the other things I also want to accomplish this summer? "Answer: One book at a time." Ya got me......so my creative stab in the dark is....plastic drinking straws, ironed flat, painted, then folded in half!! toilet rolls?!! is that what the petals are made of? Great post T! Love the green page. My guess is that your petals are made of the large copper staples on furniture or appliance boxes. What is the prize anyway? You guys are all so great! What good ideas--I may have to add those in to the class notes! However, Grafx, now you finally really really need to send me your e-mail address, since *ting ting ting* you are our lucky winner! I would love to send you a gift certificate for Amazon.com. Please e-mail me at talena[at]wintersdayin[dot]ca. hey you should go see the Creation Museum in Kentucky when you come down here the next time!.. Well, I was going to put my two bits in but I see I woulda lost. Congrats grafxgurl! How cool that the layout cost you so little! That's a huge bonus since scrapbooking can get so costly. I'm sure that's a class people would really have appreciated.